Secrets of Men in a Lifeboat is thought-provoking and unusual. It touches on difficult topics such as anxiety, autism, infidelity, divorce, depression, and suicide in a realistic manner and without stigma, which I found refreshing. I believe it will become a favorite of book clubs because it’s packed with symbolism and issues ripe for discussion. 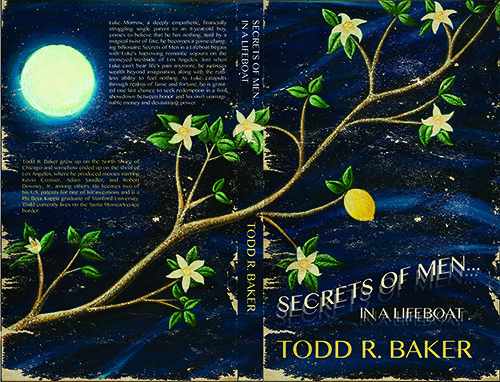 Todd R. Baker has written a strong debut novel. Secrets of Men in a Lifeboat is haunting and unforgettable. Todd R. Baker’s debut novel, Secrets of Men in a Lifeboat … is an out-of-the-park home run. Baker writes skillfully about Silicon Valley stardom with a satirical insider’s view of the Disneyesque lifestyle and expectations so many in that nanoscopic slice of the world come to see as reality. In fact, [protagonist Luke Morrow’s] rise is so fabled that he even decides he wants to conquer space; it comes as no surprise when his seminal flight reveals that not even Earth is big enough for his dreams and reach. (A direct shot at Elon Musk’s SpaceX and Jeff Bezos’ Blue Origin? Do billionaires’ egos really stretch that far?) Secrets offers a wholesome finish and succeeds on so many other levels that it is well worth the read, especially in our present political climate where a blustering billionaire has bullied his way to the head of a national party, unashamedly touting the power of his billions, and where social media worship has transformed our culture to such an extent that Likes, Followers, and Snaps eclipse the bright lights of conscience and soul. Secrets of Men in a Lifeboat lays bare the warped narcissism of an unconscionable American billionaire, championing the redemptive antidote to him: a return to civility and basic decency. In the time of Donald Trump and garish Trumpism, Secrets of Men in a Lifeboat restores crucial faith in our most principled values: honor, empathy and love. At a moment when America’s adoration of its financial giants is approaching a unique level of madness, Todd R. Baker comes to remind us what dangerous heroes we have wrought. A timely morality tale, observed with an insider’s fidelity. There are many tender scenes between Luke and his son… Luke’s rise from despair […] takes readers on a journey full of riches… A Faustian tale of a SoCal man given the choice between fame and fortune or his heart and soul. An inventive blend of fable and satire that expertly captures the complexity of the lives we lead. I found much to admire in the novel. Todd is clearly a talented writer, with a special gift for dialogue. I especially enjoyed the portrayal of the father-son relationship—tender, funny, and true. © 2015, Miportfolio. All Rights Reserved. Site design and cover painting by Cynthia Reeser.